1. 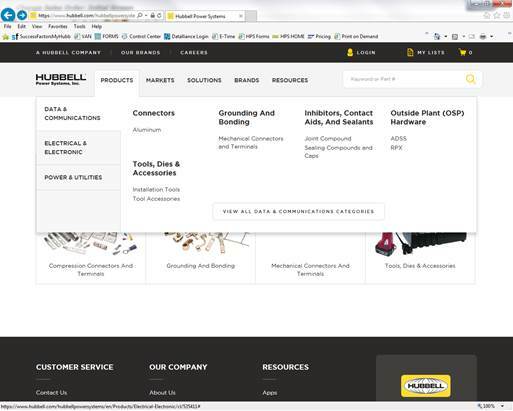 Drilling down into product information - When you hover over "Products" on the homepage, you'll see a dropdown with different market options (Data & Communications, Electrical & Electronic, and Power & Utilities). The "Connectors" selection under Data & Comm is different than Connectors in Power & Utilities. Make sure you are in right market before you choose your category selection. Products are divided by product categories (i.e. anchors, arresters, connectors, switching, etc.) and then subcategories. As Internet usage continues to experience double-digit growth, the demand for real-time, accurate data is growing at a similar pace. We are sharing information faster than ever and our human ecosystem is shifting to accommodate the transformation. The world on a whole is even moving faster; it is said that we walk 10% faster on city streets than we did a decade ago. There are currently 3.6 billion people online, and within the next 18 months, another 2.2 billion are expected to join. By summer 2018, more than 80% of the world’s population will be online. From smart grid to "The Internet of Things", data is driving change in our industry and our day-to-day experiences. 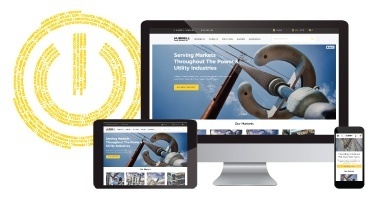 Thanks for visiting the Hubbell Power Systems' blog. Please subscribe to stay connected and we will update you when new content is published. If you have any suggestions for content you would like to see, please contact us at emarketing@hubbell.com. Hubbell Power Systems is a proud member of the Hubbell family. Click to learn more.